ANY DAY CAN BE A DRUG GIVEBACK DAY! Take any unwanted medications to the Ardsley Police Station and simply drop them in the box, no questions asked, 24/7. To protect your privacy, remove or cross out any personal identifying information such as name, phone, and prescription number before depositing in the MedReturn unit. 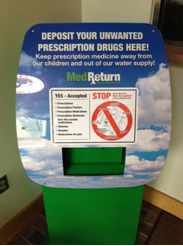 Why is it important to dispose of any unused or unwanted Prescription or over the counter medication? It’s also good for the environment! Please do not flush medication down the toilet, it pollutes our drinking water. All collected medications are taken by the Ardsley Police to a DEA approved facility for proper disposal.